Take a snapshot of Petersburg, Alaska, and show it to your friends. They'll probably think it's a picture of a Norwegian coastal village. That's because the fishing town's Norwegian roots are readily apparent. They show through in the town's neat, white houses -- some located on piers and pilings -- which are decorated Scandinavian-style with carefully tended window boxes full of flowers. Scenic tableaus of brightly colored fishing shacks, surrounded by boats in the harbor behind and set against glacier-covered mountains, are as common there as in the Old Country. Petersburg, located on Mitkof Island in Frederick Sound, was founded in 1890 by Norwegian immigrant Peter Buschmann, who came to the area to open a fish cannery. Many of the 3,030 locals still make a living fishing for salmon and halibut in the fish-rich waters. The town has several fish processing operations -- some small and family-owned and others that are larger. It's a town where everyone knows your name. The toy store on Sing Lee Alley (a tiny street on the water) even has a chalkboard where local children's birthdays are posted each month. Four blocks of Nordic Drive make up the main drag, where you'll find family-owned businesses that include grocery and hardware stores. Beyond that are residential neighborhoods, rain forests and water. And despite all the blond Alaskans of Norwegian descent you'll meet there, a federally recognized Tlingit tribe also lives in the community. About 7 percent of the residents are of Native American heritage. 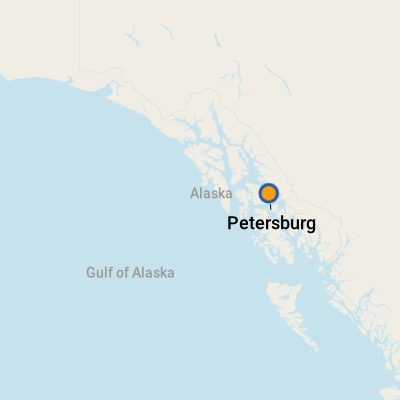 Petersburg is an isolated place with its nearest big neighbors -- Juneau and Ketchikan -- each about 150 miles away (10 hours or more by ferry). 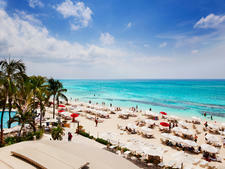 Not surprisingly, the main attraction for cruise-ship visitors is the surrounding natural scenery and wildlife. The town is only 25 miles from the calving LeConte Glacier, the southernmost saltwater terminating glacier in North America. And hundreds of humpback whales make the Frederick Sound their feeding grounds every summer. Since only small cruise ships can visit (the harbor is not deep enough for the big ones), you won't encounter crowds in Petersburg. What you will find are friendly locals, cheerfully welcoming visitors to their remote Alaskan outpost. The small ships that visit use various docks within walking distance of the town center. There's not much to do near the pier except watch the comings and goings of the fishing fleet, take in the view and scan the waters for seals and other marine animals. Head to the wooden boardwalk of Sing Lee Alley for quaint little shops and small-town, seaside ambience. Items you think are made in Alaska should be stamped "made in Alaska". Otherwise, they may have been made in China or elsewhere. By Taxi: If you need a cab, try Midnight Rides (907-772-2222) or Viking Cab (907-518-9191). It's a pretty sleepy town, so taxis aren't readily available unless you call. Renting a Car: There's an Avis car rental desk at the Tides Inn (307 N. First Street, 800-665-8433), which is within walking distance of the cruise ship docks. On Foot: Petersburg's docks and tiny downtown area are easily explored on foot. It can be fun to wander the docks and watch fishermen cleaning their vessels. U.S. dollars are used, and ATM's are available at First Bank and Well's Fargo Bank on North Nordic Drive. English is the most widely spoken language. Dining options are few in tiny Petersburg, and most of them offer some form of seafood -- the local specialty. Because many food items have to be flown or shipped in from other parts of the country, prices can be on the high side. Pick up locally made items like knitwear, quilted products and canned, smoked salmon. You never know when you'll get a once-in-a-lifetime glimpse of a black bear standing in a dense forest or a 30-ton humpback whale breaching in the distance at dawn. 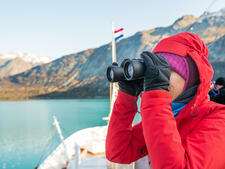 It makes a lot of sense to invest in a first-rate pair of binoculars to bring on your Alaska cruise if you don't want to miss a thing. Alaska is one of those places where you want to get off the beaten path and experience the landscape -- the "real" Alaska. Luckily, the cruise lines make it easy with shore excursions that range from the sublime to the extreme -- from a ride on the White Pass & Yukon Route Railroad to see the beautiful scenery to a hike in crampons atop a pristine glacier. Recognizing that the Alaska demographic is fairly broad, cruise and excursion companies offer active itineraries -- hiking, biking and kayaking -- in addition to tours for history-lovers, those interested in native culture and those looking for pure entertainment -- like the Lumberjack Show or Duck Tours in Ketchikan. There is truly something for every taste. Here are our favorite Alaska shore excursions among the copious offerings. While many cruisers have their first glimpse of Alaska only through bigger ports such as Ketchikan and Skagway, there have always been those who want to take the route less traveled through the Inside Passage. Enter small ships. Able to dock in isolated bays and tiny cities like Petersburg and Wrangell, small ships provide more intensive -- and usually more expensive -- ways to explore Alaska's coast. Life onboard an Alaska small ship, which typically carries fewer than 100 passengers, is a far more relaxed experience than you find on a standard cruise. You wake up to the sound of birds instead of noise from the balcony next door. 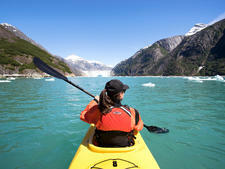 Your days consist of kayaking or hiking, rather than shopping and taking helicopter tours. Evenings are spent reading in your room or listening to a naturalist talk. And there's no need to buy a new cocktail dress, although you might spend just as much on outdoor gear. Fortunately for adventurous travelers eager to embark on Alaska expeditions, several cruise companies offer these intimate, nature-focused experiences. Even better, the lines are expanding their fleets, as well as their itinerary and excursion offerings. 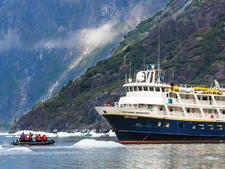 Here's a look at Alaska's small ship cruises and where they're going. 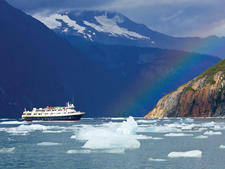 Is an Expedition Cruise in Alaska Right for You? To see if you're ready for an Inside Passage closeup -- or should stick to the big ships -- check out our reasons to love or hate an expedition cruise, and see where you land.